In the summer of 2014 I travelled to St Gallen, Switzerland with the express purpose of visiting the town’s Baroque Abbey and Library. The library or Stiftsbibliothek, as it is known locally, houses a collection of manuscripts, incunabula and books. The collection represents one thousand four hundred years of knowledge and information. As you enter the elegant baroque library there is a sign in Greek above the door, it translates as ‘Sanatorium for the Mind’. How perfect. A wonderful description for this extensive and magnificent collection of books, parchments and early manuscripts.ORIGINS – SCRIPTORIUM – Some of the earliest hand-written manuscripts – dating from the 8th century are to be found here. This makes the library the largest in Switzerland and perhaps the most important repository of history, language, religion and culture in Continental Europe. The story of the Abbey started here in verdant, rural Switzerland when a simple place of worship was founded by Gallus, an itinerant monk, around the year 612. Originally there was no more than a hermit’s cell and a simple prayer house. Gallus was thought to be from Ireland, although he possibly came from the Lorraine area of north-east France. Whatever his origins he followed the Irish Monastic tradition of wandering the countryside preaching the word of God and establishing places of worship. From these humble beginnings a monastery developed here. The inhabitants followed the ‘Rule for Monks’ written by St Benedict, which stated that the day should be divided into prayer, lecta divina, work and study. This scholarly approach to daily routine is supported by the fact that a ‘Scriptorium’  existed at St Gall as early as 760. To put this in context we are talking more than 1250 years ago! The ‘Scriptorium’ was the area, adjacent to a library, where scribes would work, copying by hand, important texts of the day. The well-known scribe ‘Winithar’ led a team of at least a dozen writers. By the 780s the ‘Scriptorium’ housed more than 60 scribes led by Waldo, who became Abbot of St Gall at about the same time. The scribes (who were also monks) painstakingly copied manuscripts and biblical texts. The first library catalogue was compiled around 860. The St Gall collection grew rapidly with successive abbots donating manuscripts to the library. For example Abbot Grimald donated 34 codices from his private collection, whilst Hartmut gave 23 manuscripts and expanded the collection by adding another fifty of his own books. THE COLLECTION IS ENRICHED – In the 9th century the art of ‘illumination’ flourished. This was when chapters of books were decorated, always by hand, with appropriate pictures and illustrations. Small paintings were inserted in the text and the opening letter of a chapter was elaborately decorated and emphasised (see the Codex above). Manuscripts such as the ‘Golden Psalter of St Gall’ were completed. However, the invasion of the Hungarians in 926 led to the monks moving the library to the Monastery of Reichenau on Lake Constance. The collection was moved on the advice of Wiborada, a holy woman and recluse who strongly advised the monks to move the library to nearby Reichenau Abbey for safe keeping. She was canonised by the Pope in 1047 and became St Wiborada – the first woman to be made a saint. She is also the patron saint of libraries and bibliophiles. By the mid 11th century the library of St Gall enjoyed a major revival with translations of scholarly texts from Latin into German. One of the most popular of these texts was ‘Casus Sanctio Galli’ an anecdotal history of the monastery from 950 – 972. It was regarded as one of the most interesting and entertaining books of the Middle Ages. The 12th and 13th centuries were a period of neglect and decline for the Abbey and it’s library. However The Council of Constance, an important ecclesiastical meeting held from 1414-18 was a turning point for the Abbey and the library. This meeting was attended by Poggio Bracciolini (1380 – 1459). Bracciolini was an Italian humanist. He and other scholars were interested in studying classical antiquity. The humanists honoured learning and education. It was their goal to create a citizenry able to speak and write with clarity and eloquence. Bracciolini was also interested in acquiring medieval manuscripts – some might call him a medieval thief. In the rather neglected abbeys of Germany, Switzerland and France he found numerous ‘lost’ manuscripts that found their way back to Rome. Bracciolini served under a total of seven different popes and followed very much in the tradition of Petrarch (1304-1374) possibly the most famous early-Italian humanist. Shortly after this plans were drawn up to build the Hartmut Tower to house the library’s manuscripts and incunabula appropriately. A catalogue of the library’s holdings was also begun. The pictures below show the incredible clarity and quality of the illustrations in these medieval manuscripts. A NEW BUILDING – In 1530 Joachim von Watt, a local humanist known as ‘Vadian’ recognised the value of the library and supported the construction of a new building from 1551-3. He acquired ‘printed’ books from Paris and asserted the Monastery and its library as a centre of learning and research. By the 17th century the Abbey was sending gifted young monks to Jesuit Colleges in Rome, Paris, Ingolstadt and Dillingen. The earliest printing press was invented by Johannes Gutenberg in 1439. The development of the printing press allowed the dissemination of information, books, pamphlets and leaflets. The printing press played a crucial role in the development of the Renaissance, and then later the Reformation and the Age of the Enlightenment. The Abbey opened its own printing press in 1633 – enabling it to print decrees, mandates, sermons and announcements for its population. In fact if you think about it, nothing has changed – ‘He who controls the presses controls the message that is delivered’. Sadly the arrival of the printing press marked the end of that ‘most magical’ of medieval institutions the ‘Scriptorium’. THE GLOBE OF ST GALLEN – My eye was immediately drawn to the magnificent, brightly coloured globe in the library. It is enormous – the diameter must be at least a meter. The globe that has caught my attention is actually a reproduction of the original that was made in Augsberg in 1570. The removal of the globe has been a source of disagreement between St Gallen and Zurich ever since. Finally more than 200 years later a solution has been reached. The St Gall globe will remain in Zurich but a magnificent replica has been created and given to the Library of St Gall. It is this wonderful, colourful, beautifully-made replica which I am looking at today. The detail is intricate. The richness of the sealife – at the Tropic of Cancer is diverse, characterful, brimming with life and energy. The Globe depicts land masses as they were known at the time. The Globe itself sits in a wooden frame, it can be adjusted and tilted to create an accurate representation of the Earth at different times of the year. I feel privileged and fortunate to have visited this incredible library and it’s diverse collection of treasures; books, manuscripts and even a ‘Curiosities Cabinet’. The ‘Curiosities Cabinet’ is a late arrival in the library’s history and includes the mummified remains of Schepenese, a young Egyptian princess from Thebes – believed to be from about 610BC. 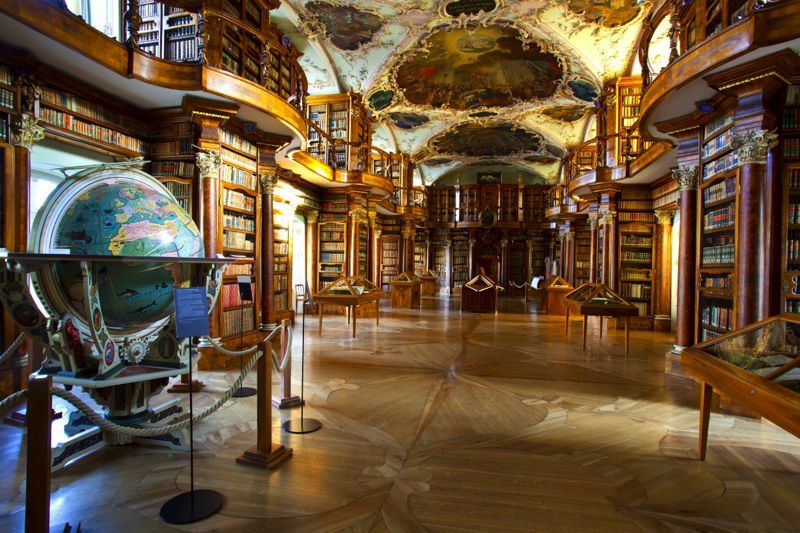 The Library at St Gallen represents a body of knowledge that has been developed and extended over a 1400 year period. The library and the collection of manuscripts and books represent written texts from the days of the ‘Scriptorium’ through to the 18th century. This is a ‘Repository of Knowledge’ that spans almost 1400 years. Even more amazing is the fact that any book published after 1900 can be borrowed. This historic library is still a lending library! If you’d like to visit the library, it is located about 90 minutes from Zurich by car. Or you can take a very efficient Swiss train. Just outside the library there is a very nice little cafe, in the Abbey precincts, serving soup, salads and light dishes. In 2015 there was an exhibition ‘Wenn Bucher Recht Haben’ which translates as: When Books Lay Down the Law. I love this title, we should never under-estimate the power of the written word. Next time you are anywhere near Lake Constance, take a diversion and visit St Gallen. Incunabula is the term used to describe early printed books, printed using the very earliest printing presses. This is defined generally as the period before 1500. Benedict was born around 480 in Umbria, Italy. He founded an Abbey at Monte Cassino. He wrote the influential ‘Rule for Monks’ which outlined how a monk or nun would spend each day; prayer, lecta divina (reading the scriptures), work and study. Benedict’s influence on early religious communities was huge. Many abbeys and monasteries were run on his principles. A ‘Scriptorium’ is literally ‘the writing place’ where the scribes worked. Usually located next to the library. A ‘codex’ (singular) or ‘codices’ (plural) are ancient manuscripts in book form. Hand written on paper, vellum or papyrus. The ‘codex’ replaced the scroll as a more convenient book format. Note – In 2017 the Abbey Library of St Gallen ran an exhibition called ‘Sanatorium of the Soul’ although I prefer the translation as ‘Sanatorium for the Mind’. Janet–You amaze me with your curiosity and where it leads. Who else would make a long journey like you did just to visit a library? I’m so glad you did–this is no ordinary library! Thank you for taking us along and explaining things along the way, you Educated Traveller, you!